…I need a Sherlock tattoo. Just saw the season finale. Wow. I need that script to pore over and live over it again and again. Will be seeing it in the theatre. Yeah, cut my hair today, is why took you a bit to see me. Little too short on one side but good enough. Oh, you won’t believe what I had to do on Monday. I had to go to the bank and order some checks. Only use them for the rent so only needed one box, but I had a moment of wondering if they actually still did them. There was something I meant to tell you about last week, something I came across. 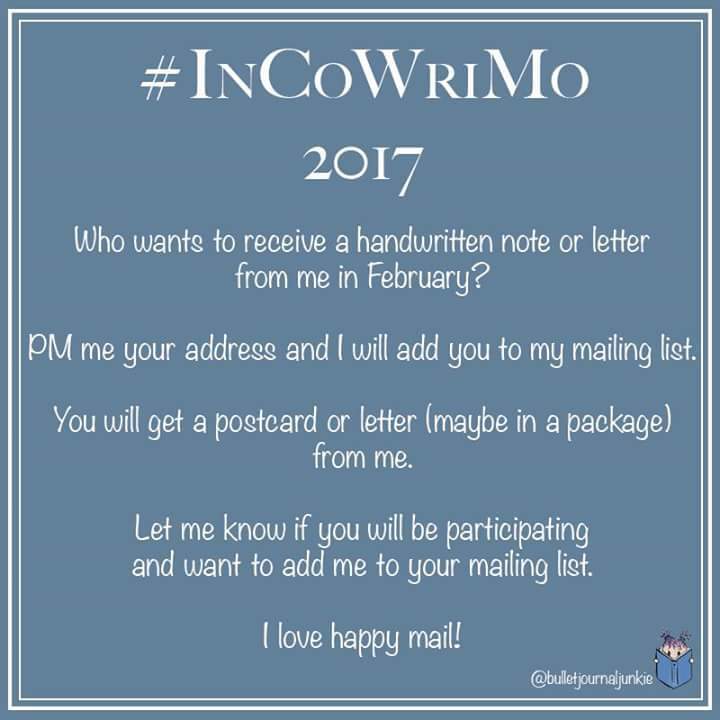 International Correspondence Writing Month. Something you might want to share. Rained some this past week. Was nice and cloudy all day today. Still need to see Rogue One. I did buy Magnificent Seven blu ray. Daily writing prompts have slipped a bit but will be catching up. Starting to think up a list of projects to do. Been a slow week otherwise. Tell you what, let me gets us a refill and we’ll go check on what the others are doing.